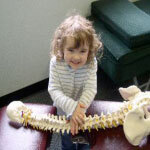 At Back 4 Life Wellness Centre our chiropractic care of babies and children is gentle. The techniques used in our practice typically involve gentle finger tip pressures (the kind you could tolerate over a closed eyelid). Where possible we highlight things that young people (or parents) can do at home to help, like stretching and strengthening exercises, training activities, ergonomics – for example how to best place computer devices and back packs.